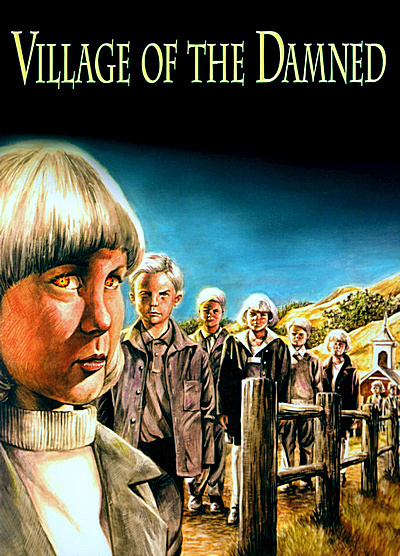 • It Takes a Village: The Making of VILLAGE OF THE DAMNED Featuring Interviews with Director John Carpenter, Producer Sandy King, Actors Michael Pare, Peter Jason, Karen Kahn, Meredith Salenger, Thomas Dekker, Cody Dorkin, Lindsey Haun, Danielle Wiener-Keaton and Make-up Effects Artist Greg Nicotero (49:18, 1080p) - a new documentary on the making of the film featuring interviews with eleven cast and crew members. Shout! asked Carpenter if he wanted to record either a commentary or conduct a new interview about the film and he chose the latter. The participants' comments are intercut with clips from the film along with VHS footage of a deleted scene. This is a well-balanced account of how the film came together. Dekker defends Carpenter's contributions on the film and is the most vociferous of all his castmates, speaking his mind with passionate conviction. Alley, Hamill, and Kozlowski do not appear here so they were probably not available. • Horror's Hallowed Grounds – Revisiting the Locations of the Film (20:59, 1080p) - in this continuing series included on Shout! 's vintage horror releases, host Sean Clark takes the viewer to many of the locations in northern California that Carpenter filmed Village of the Damned. • The Go to Guy: Peter Jason on John Carpenter (45:14, 1080p) - Carpenter's frequent collaborator looks back with nostalgia and guffaws at several of the films he's worked on with the director. Filled with many amusing stories. • Vintage Interviews Featuring John Carpenter, Christopher Reeve, Kirstie Alley, Linda Kozlowski, Mark Hamill and Wolf Rilla (Director of the Original VILLAGE OF THE DAMNED) (14:20, 1080p upconvert) - a compilation of brief interview segments with Carpenter, Reeve, Alley, Kozlowski, Hamill, and Rilla that were culled from Universal's original EPK. They are presented full-frame with VHS-like quality. • Vintage Behind-the-Scenes Footage (10:19, 1080p upconvert) - this B-roll footage immediately follows the collection of older interviews. It shows Carpenter directing the actors in several different scenes. • Theatrical Trailer (2:00, 1080p) - a 16x9-friendly original studio trailer which appears in decent shape. It is in anamorphic widescreen with a very thin black border around all four sides. • Behind-the-Scenes Still Gallery (2:00, 1080p) - a compilation of twenty or so production stills, lobby cards, ad slicks, and theatrical poster sheets from Universal's press kit and publicity campaign.